Linner | my heart is happiest when i travel. read. write. connect. I’m soooo excited for Spring Break!! Just another 8 days of work, and then I get a magical 12 days off! 🙂 Linner is coming for part of my break, and I’ll be doing a bit of solo travel, too. Today I finalized my plans and I’m really looking forward to it! When Linner arrives, we’ll have a quick staycation in Bangkok. The plan is to visit the Floating Market (new to us both), stay in a posh hotel downtown with a rooftop pool, get massages, and eat yummy Thai food. All in all, my kinda thing. 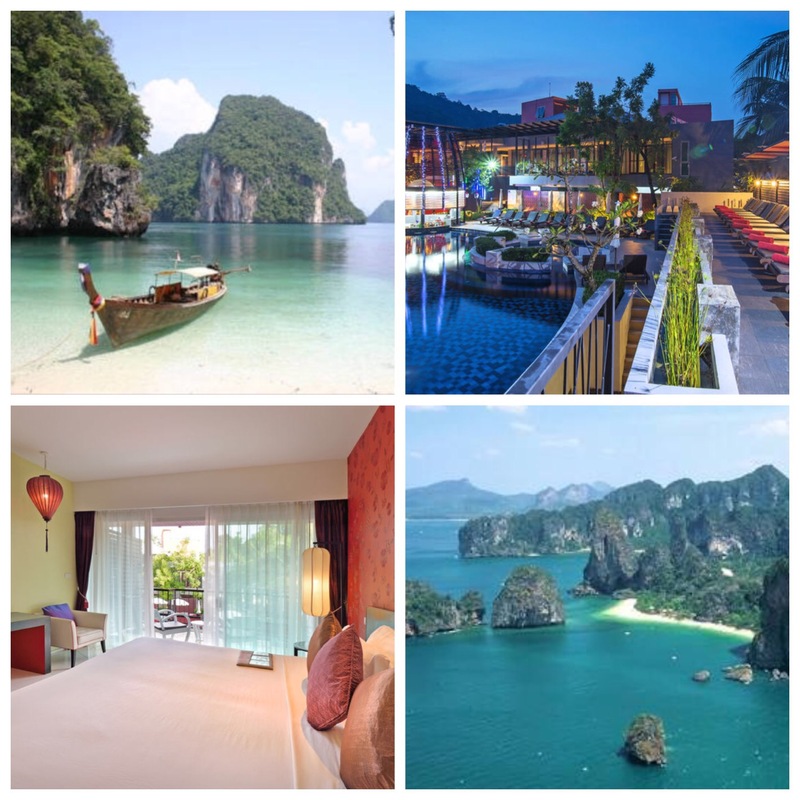 Linner and I will travel to Krabi, Thailand and stay in Ao Nang at a sweet resort not too far from the beach. I plan to lay by the pool (hopefully I can get in, too! ), relax with a pina colada or a fresh juice, and read. We’d also like to explore Ao Nang beach. Again, I hope to take a dip. Ao Nang has beautiful beaches, with huge rocks and cliffs nearby. I’d like to take a boat ride one day. Once Linner leaves, I’ll be solo traveling to Indonesia! After a quick stop-over in Jakarta, I’ll fly to Ubud, Bali, where I will be staying at a relaxing hotel near the city. It has a pool with lounge chairs, a spa, and a good restaurant. The best part is it only cost me $34 a night, including breakfast! There’s a free area shuttle, and if I’m mobile and able to walk around, I plan on exploring. If not, I’ll lounge by the pool, reading and writing. Either way, it’ll be a relaxing trip! This entry was posted in Slice of Life, Travels and tagged #slice17, #slice2017, #sol17, ao nang, bali, indonesia, krabi, Linner, relaxing, Slice of Life, Slice of Life Challenge, solo travel, spring break, Thailand, Travel, traveling, ubud on March 26, 2017 by aggiekesler. Last night, Linner (my nickname for her) and I headed out to Shook, a restaurant in the Swatch Hotel on the Bund, for a fancy Restaurant Week dinner. We both love fine dining, and when we can get it for a cheaper price, we love it even more! Our first course was the Tomato Basil Bisque with Grilled Cheese “Soldiers.” Giggling as we ordered it, we talked about how we can’t understand why restaurants feel the need to make up names for food like that. They’re mini sandwiches, not soldiers. Just call it what it is. As far as the taste, the soup was really nice, but I personally make better grilled cheese. Our main course was the Pan Roasted Snapper with Potato Puree, Blistered Tomatoes, Cucumber, Fresh Herbs, Ginger, and Tamarind Sauce. First thought was that the presentation was gorgeous. Second thought was what’s all this cilantro doing on my plate? I despise cilantro, and would have noticed that on the menu. Ahhh…it must be the fresh herbs. Luckily, it was just on the top, so I could easily pick it off. After that, the meal was really tasty, but on the smaller size portion-wise. Our third course, always my favorite, was dessert. Linner had the Lemon Cheesecake with Maple Cranberry Compote, Toasted Walnuts, and Whipped Cream while I had the Coconut Lime Creme Brulee. My creme brulee was perfectly done, with that crispy sugary coating you have to hit just right with your spoon to get into the creamy custard beneath. We shared both, as we sipped our cocktails and shared stories. Linner is one of those friends who will always be there for you. Whether we’re getting together to swap funny stories, laugh at the happenings of the week, and reminisce about the past, or we’re supporting one another through a tough time, she’s a sweet, loyal, dear friend. Tonight’s conversation was light and fun, filled with stories. We remembered the time she got the nickname Linner, and how she hated it every time I called her that….until I was relentless and she gave in, accepting that, to me, she was no longer Linnea, but the less beautiful-sounding Linner. I playfully call her ‘Linner, Linner, Chicken Dinner.’ Secretly, she loves it. We also recalled the time I changed her boyfriend’s name in her phone to ‘Dee my lover’…haha, she was so mad about that one because she couldn’t figure out how to change it back. It stuck until she finally was able to change it a few days later. We talked about the time in Seoul, on vacation together, when I realized that Linner was not to be messed with in the morning. Taking pictures of bed head is not her idea of fun…haha. I’ve realized that throughout our friendship, I pick on her, but she’s a good sport and we’re still friends. 🙂 She’s the nicer one of the two, for sure! This entry was posted in Slice of Life and tagged #sol15, Bund, friends, Linner, restaurant review, Shanghai, Slice of Life on March 20, 2015 by aggiekesler.